At the end of April, I will be speaking/outreaching en femme at two Human Sexuality classes. I also may be doing the same at one or two Abnormal Psychology classes before the end of the spring semester. Next month, I will spend four days en femme (24/7) traveling to and from Dayton, Ohio and attending the Hamvention there. In early June, I may attend my law school's reunion. I say "may" because so far, only three people from my class have signed up for the event. And I only know one of the three. So, at this point in time, it wouldn't be much of a reunion for me. But there is still time for that situation to improve. After that, summer means fun! It seems like a good amount of outreach in several interesting venues. I would even call your time at the Hamvention outreach. I think it would be great if you could attend your law school reunion ~ if it is not scrubbed. If you only know one other person then attending en femme should not present a problem. It will be a good form of outreach to a group that needs educating. Also if you are among attorneys you can always ask a question or two to create a priviledge. I think it great that you're speaking and outreaching! To do that enfemme is to walk the talk, but you are very pretty! We need more of that. Is the Hamvention the reason that you will drive back and forth? If so, why don't you just pack and stay in a hotel? BTW, I think it's great that you attend regardless if your enfemme or not. Communication is a most misunderstood topic and HAMS might be needed in the very near future! As for the Re-union, I say go if you feel the desire. 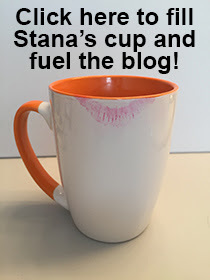 Regardless, let us read all about it, Stana! Billie --- Sorry to mislead you. I will drive to Dayton, stay at a local hotel while attending the Hamvention, then drive home after the Hamvention. I remember a few years ago when you'd pack Stana (or was it Staci then) away until the summer heat and humidity was over.